Our exciting fall art classes are fun-filled with drawing, painting, printmaking, photography & more. Classes held among real working artist studios benefit from the atmosphere and energy of a vibrant art studio. Small class sizes mean lots of individualized attention and instruction. 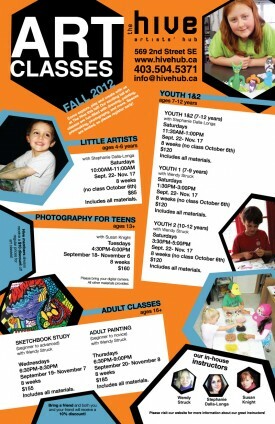 Hive members will always receive a $10 discount on all art classes. See us about becoming a member! Also, The Hive offers a “Bring-A-Buddy” special on all classes! Bring a friend/sibling and both of you will receive a 10% discount! The Hive Artists’ Hub Society strives to promote local art and artists and supports the local art community. We also protect the environment and support small business by selling handmade and up-cycled products. And since proceeds from sales and classes are used in achieving these goals, when you buy products and register in art classes, you are helping the whole community! The Hive provides promotional & educational opportunities as well as support and services to its members. The Hive is also an artistic and educational resource for the community. It is a vibrant part of Medicine Hat playing an important role on the cultural scene and in the tourism industry. This entry was posted on Sunday, September 16th, 2012 at 10:01 AM and is filed under Art Events, Artists, Stores & Businesses. You can follow any responses to this entry through the RSS 2.0 feed. You can leave a response, or trackback from your own site.